We return to earth after our brief visit to the moon in the past couple of articles and examine sites that are aligned to the moon. 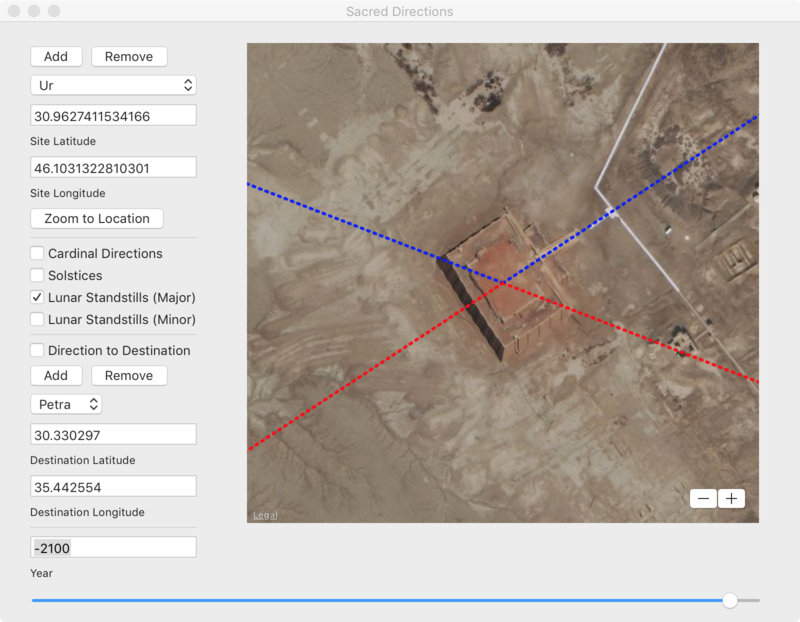 In this article, with the help of a newly developed archaeoastronomy app, we review sites from around the world that are aligned to the moon. We start in Britain the home of Stonehenge, one of the most famous and enigmatic of all ancient sites. Although it is generally known when it was built, around 3100 BCE, no one knows exactly why it was built or by whom. Around 2600 BCE a large stone known as the Heel Stone was added outside of the inner circle of stones and positioned so as to line up with the summer solstice sunrise when it is viewed from the center of the site. At the same time, four other outlying stones called Station Stones were arranged to form a rectangle around the central monument. One of the Station Stones was positioned in the direction of maximum southern moonrise, also called a major lunar standstill. Today, these alignments are off by about a degree due to the change in earth’s obliquity since the time they were set into place more than 4000 years ago. 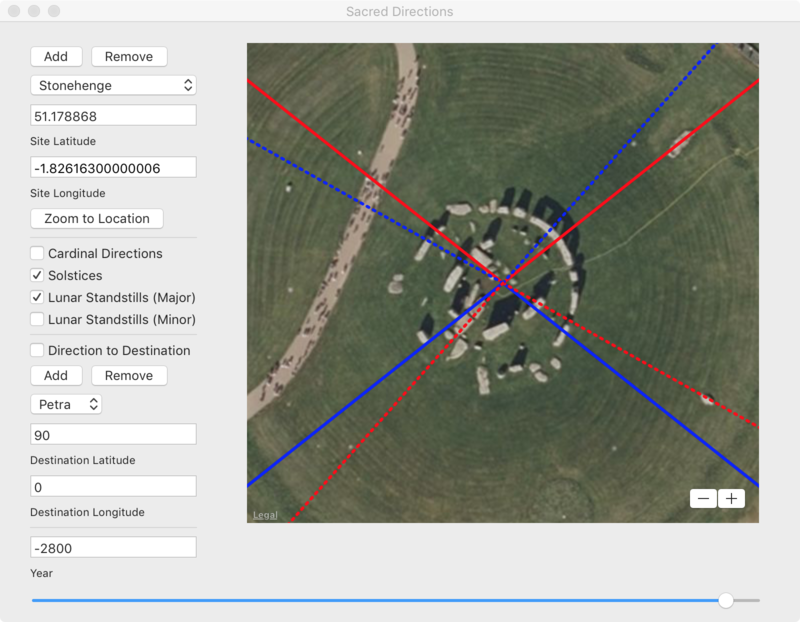 Figure 1 Alignments at Stonehenge. Solstices are depicted as solid lines and lunar standstills as dotted lines. 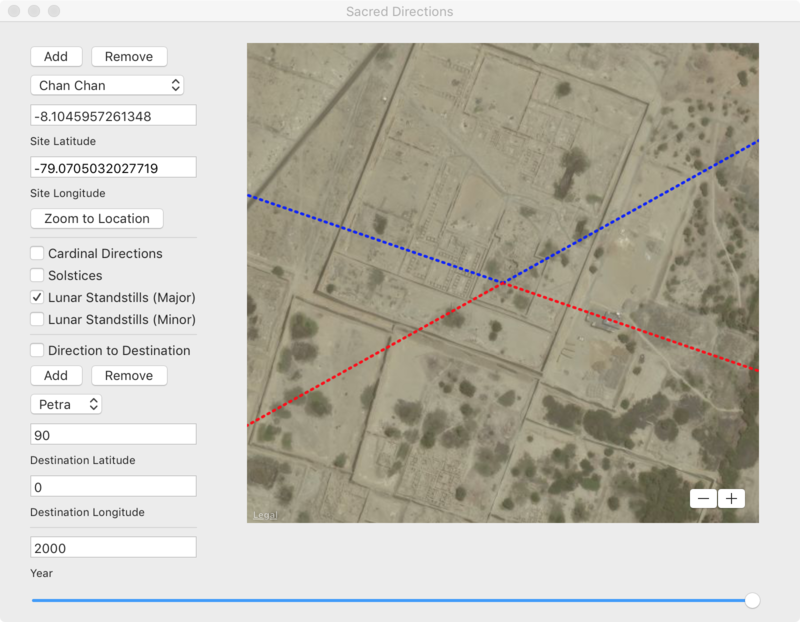 Time slider shows the direction of the alignments around 2600 BCE. There are other sites in Britain that also appear to reference the motion of the moon. The Calanais Stones are in the Outer Hebrides in Scotland. The circle of stones, which is thought to have been set in place between 2600 and 2800 BCE has been interpreted by several researchers to have been used as a lunar observatory. Figure 2 Alignments at Calanais around the same time as Stonehenge (2600 BCE). A little later in Mesopotamia King Ur-Nammu built a ziggurat dedicated to Nanna, the son of the two original Sumerian deities, Enlil and Ninlil. Nanna was the god of the moon and wisdom yet ironically the temple dedicated to him was called “Etemennigur,” which means “House whose foundation creates terror.” As shown in Figure 3 the Ziggurat of Ur is aligned in the direction of maximum northern major lunar moonrise and maximum southern major lunar moonset with best alignment achieved around the accepted time of construction, approximately 2100 BCE. Figure 3 Alignment of the Ziggurat of Ur to major lunar standstills around 2100 BCE. 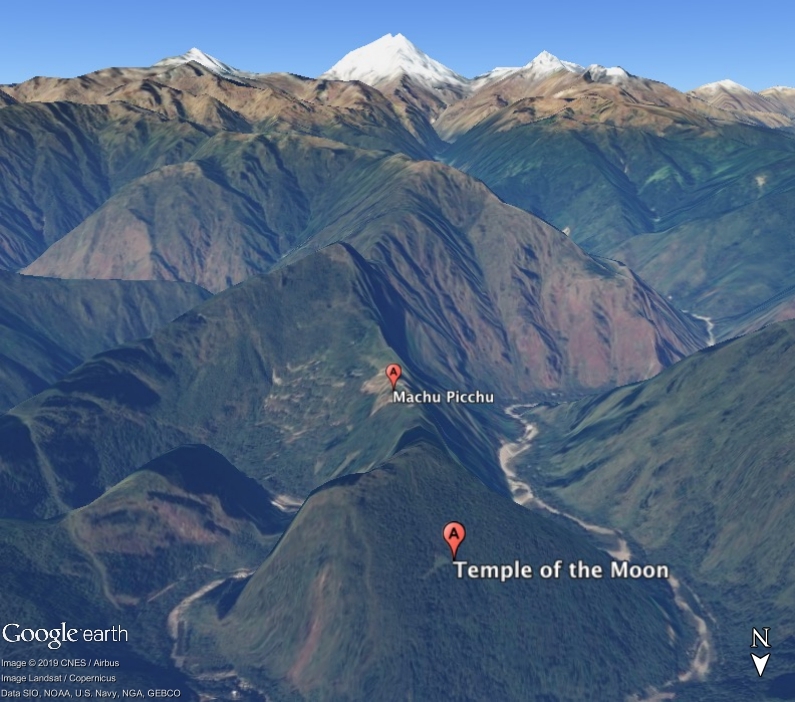 Few temples in India appear to be aligned to the moon. According to Sikh historical records, the land that became Amritsar was chosen by Guru Amar Das, the third Guru of the Sikh tradition. Arjan, the fifth Sikh guru, completed the Golden Temple in Amritsar in 1604. 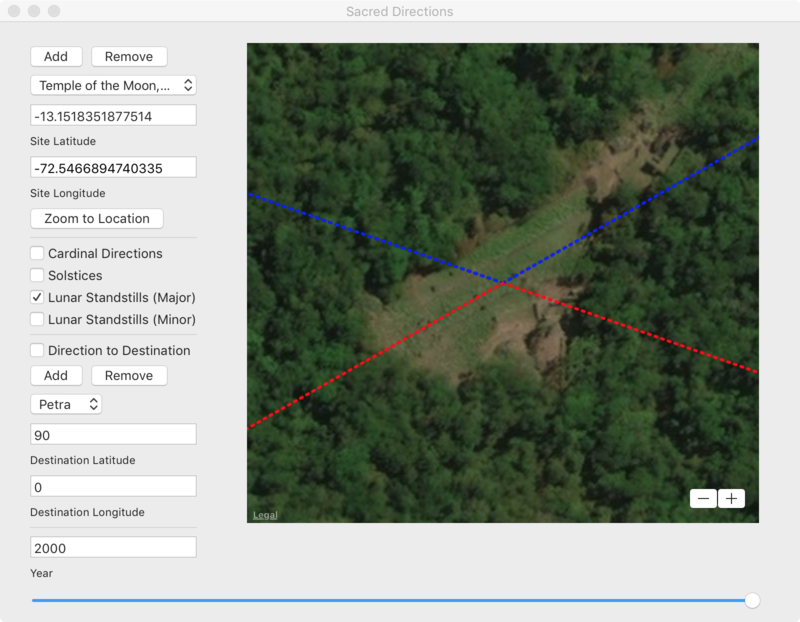 The overall layout of the site including the reflecting pools is consistent with the direction of minor lunar standstills. (Recall major standstills are the most northern and southern moonrises and moonsets and so minor standstills are the least northern and southern moonrises and moonsets.) What is unusual about the site is that the best alignment is achieved when the earth was at minimum obliquity, approximately 14,000 years ago (Figure 4). If the Golden Temple is aligned to the moon perhaps Amritsar had been an even earlier site of religious significance. 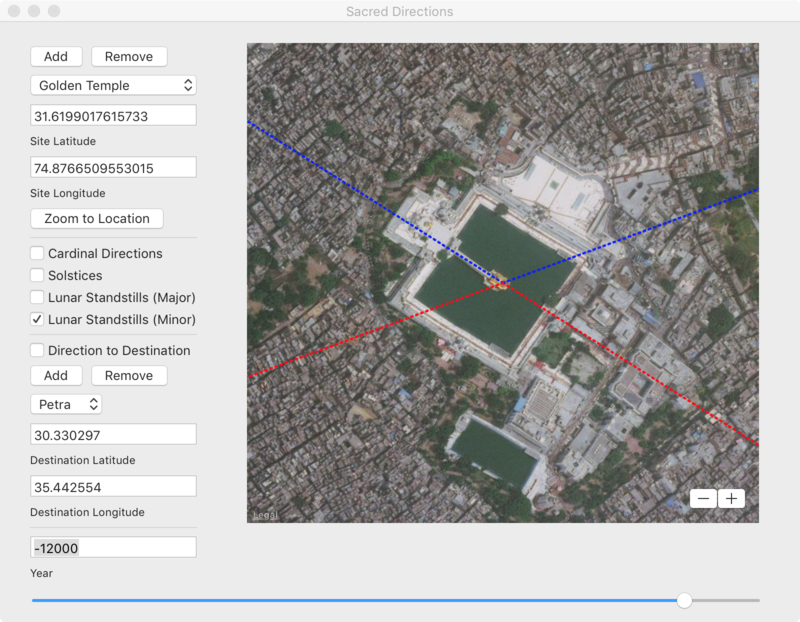 Figure 4 Alignment of the Golden Temple in Amritsar to minor lunar standstills. Continuing east, the Khmer empire constructed monumental cities and religious sites in Cambodia around a thousand years ago. 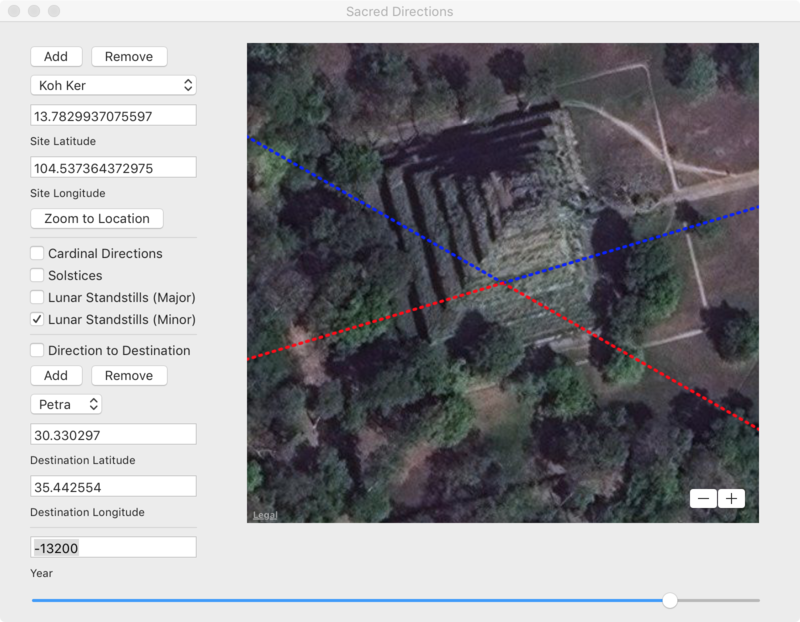 Where most places including Angkor Wat and Angkor Thom are aligned to the cardinal direction, others such as Preah Khan and Koh Ker are not. Preah Khan of Kompong Svay is approximately 100 km east of Angkor Wat. It consists of a series of four concentric rectangular enclosures that contain temples, buildings, and a central sanctuary. 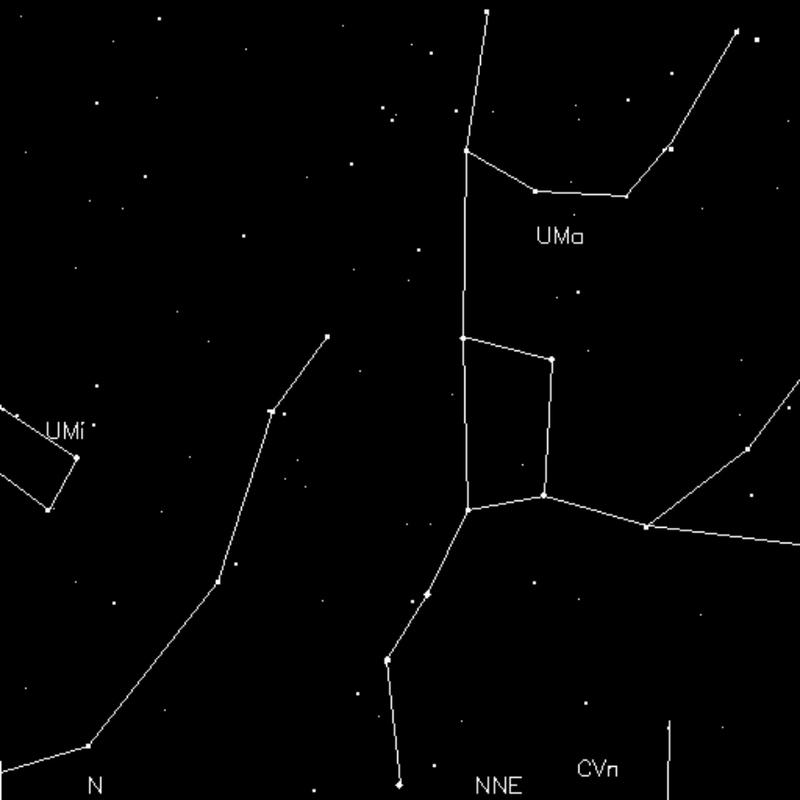 According to Giulio Magli the site is aligned to the moon, specifically to the northern major lunar standstill. Based on a single dated inscription, the site is thought to have been built around 1000 CE, which turns out to be consistent with the alignments in Figure 5. Figure 5 Alignment of Preah Khan to major lunar standstills. Koh Ker is 50 km north, northwest of Preah Khan. In the same paper referenced above, Magli argues that Koh Ker is aligned in the direction of sunrise on the day when the sun rises directly over the site (zenith passage). Figure 6 suggests another possibility – that the site was aligned to the northern minor lunar standstill approximately 15,000 years when the earth was near minimum obliquity. 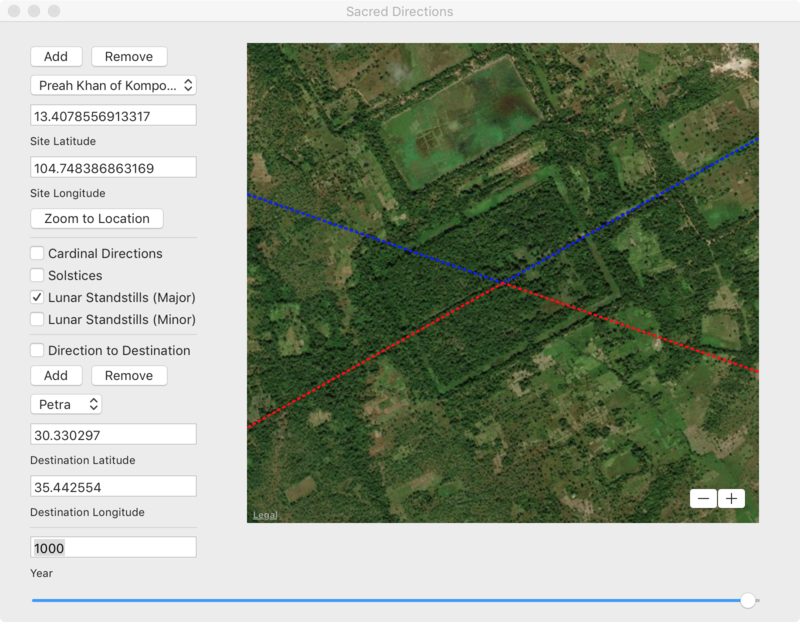 Figure 6 Alignment of Koh Ker to minor lunar standstills. As discussed in Before Atlantis, Chichen Itza and Tulum are two sites in Mexico’s Yucatan Peninsula that might have been aligned to an earlier location of the North Pole in the Norway Sea. Many of the structures at Chichen Itza including the Caracol also appear aligned with major lunar standstills (Figure 7). The Caracol is believed to have been used as an observatory by the Maya who were familiar with the motions of the sun, moon, stars, and planets. 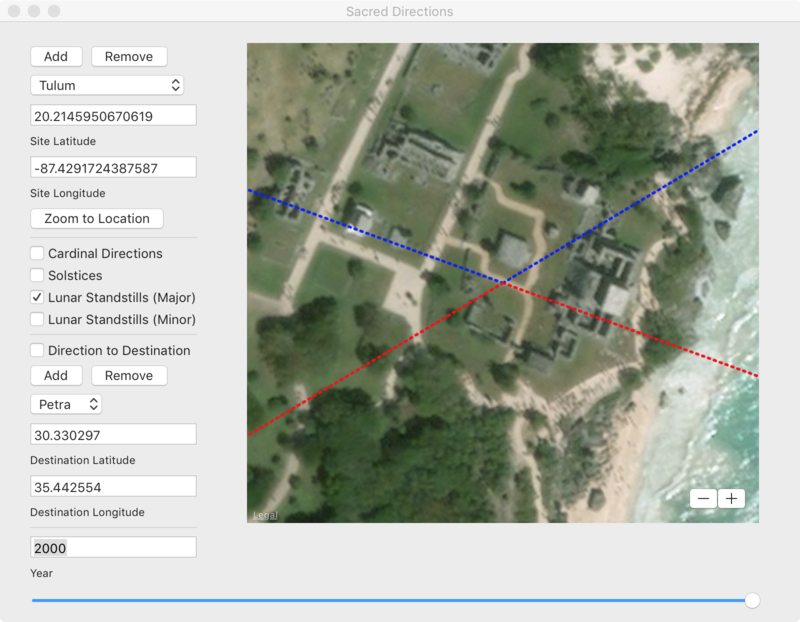 The alignment of most structures at Tulum also appears to be aligned with major lunar standstills (Figure 8). Figure 7 The Caracol at Chichen Itza is aligned to major lunar standstills. Figure 8 Most structures at Tulum are aligned to major lunar standstills. Located in Peru, Chan Chan is believed to have been built around 850 CE by the Chimu culture. The etymology of the name is thought to be derived from the Quingnam “Jiang” or “Chang” which means Sun. The name could also be derived from the term: “Shian” where “Shi” translates as Moon and “An” as house, meaning House of the Moon. 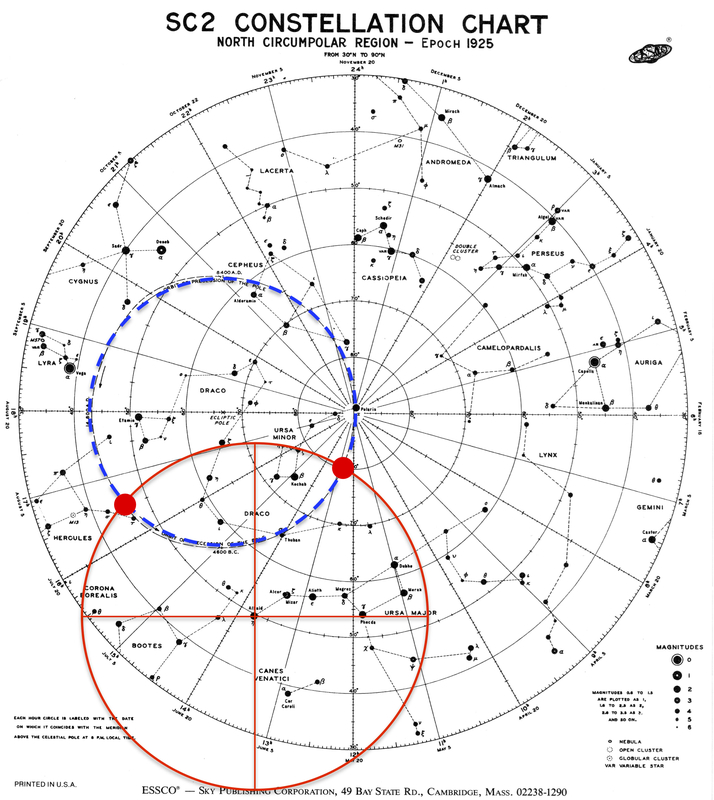 As discussed in Before Atlantis, the orientation of Chan Chan correlates both the direction of the Norway pole and to major lunar standstills. One explanation that satisfies both the solar and lunar interpretations of its name is that the original site was constructed long ago when the North Pole was in the Norway Sea and so was originally aligned to the cardinal directions and to the sun. Later it was co-opted by the Chimu, who repurposed Chan Chan as a lunar site as a result of its serendipitous realignment to the moon. Figure 9 Part of an extended area in Chan Chan aligned to major lunar standstills. On a mountain top north of Machu Picchu lies a site called the Temple of the Moon that is built into an open-face, shallow cave. Like other places in Machu Picchu, the site is generally thought to have been arbitrarily named. Figure 10 shows the site in a Google Earth perspective view looking south. Figure 10 View looking south from north of Huanya Picchu toward the Temple of the Moon. Being in the tropics south of the equator the sun moves north after sunrise at certain times of the year and south at other times. The moon also travels north after moonrise at certain times of the year as well. The cave opening faces north and spans the maximum possible northern range of lunar motion (Figure 11). That the cave was oriented in this direction for the purpose of observing the moon would seem to be no accident. Figure 11 The Temple of the Moon faces north, which is not visible in the view. The blue dotted lines depict the full range of lunar motion visible from the cave opening. We complete our journey around the world in North America and examine two Native American sites that appear to be aligned to the moon. Ocmulgee Mounds National Historical Park in Georgia contains the remains of major earthworks built before 1000 CE by the South Appalachian Mississippian culture that includes the Great Temple Mound and other ceremonial mounds, a burial mound, and defensive trenches. Evidence suggests the site has been continuously occupied for 17,000 years. As shown in Figure 12 The Great Temple Mound appears to be aligned to the southern minor lunar standstill. 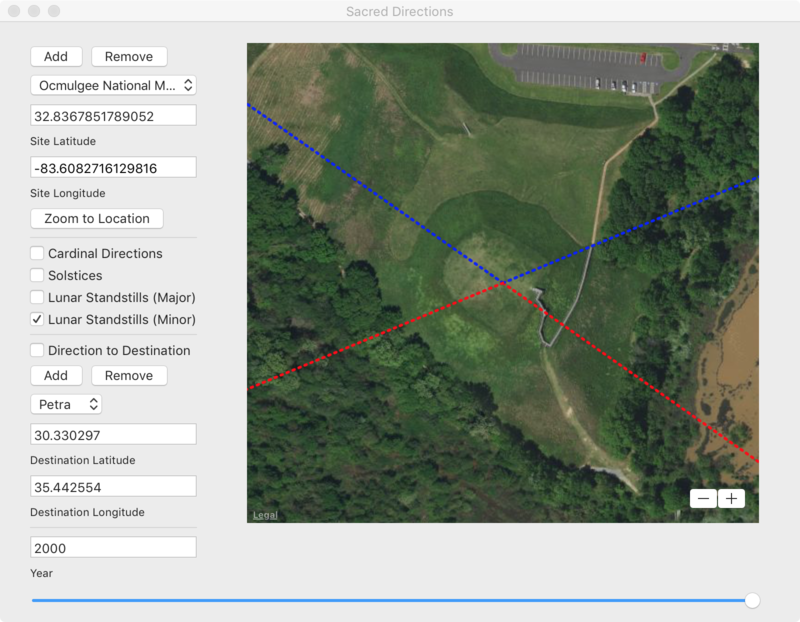 The nearby Lesser Temple Mound also appears to be similarly aligned. Lunar alignments are thought to exist at Cahokia another Mississippian site in Illinois as well. 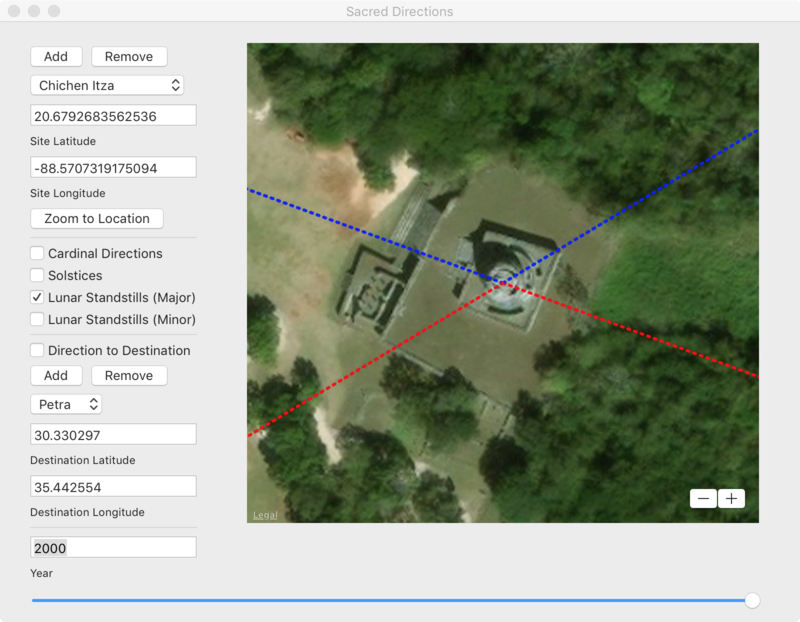 Figure 12 Alignment of the Great Temple Mound at Ocmulgee to minor lunar standstills. Pueblo del Arroyo is an archaeological site in Chaco Canyon, New Mexico. The structure was a “great house” built in the latter part of the 11th Century by the Ancestral Puebloan or Anasazi people, who are thought to have built many structures in alignment with lunar and solar (seasonal) cycles. Given the flatness of the surrounding terrain, the location of the site would seem to take full advantage of its alignment to the southern maximum moonrise and northern maximum moonset (Figure 13). 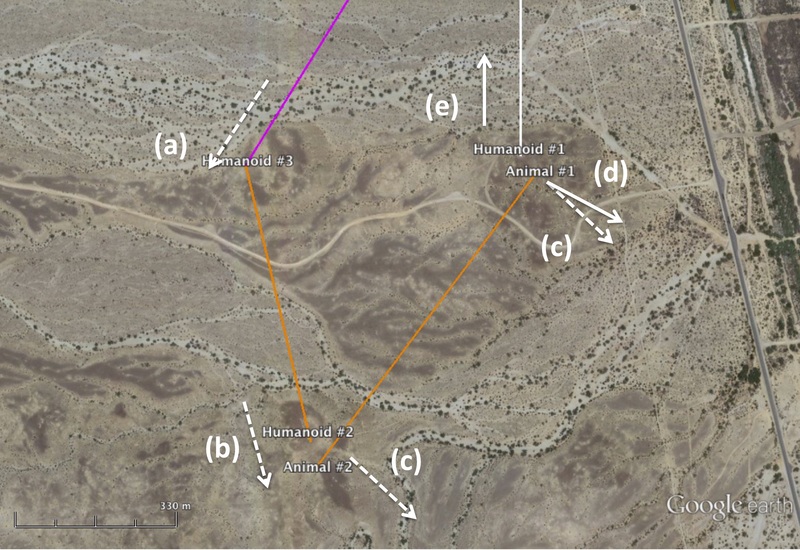 Figure 13 Alignment of Pueblo del Arroyo in Chaco Canyon to major lunar standstills. Numerous sites all over the world are aligned to the moon. Where the seasonal path of the sun is easily discernible, the complex motion of the moon, which repeats in 18.6-year cycles would have required dedicated observation over a much longer period of time. Although it is possible that the builders of these and other sites that are aligned to the moon did independently discern the complexity of lunar cycles it is also possible that this knowledge was inherited from an earlier people, perhaps from an unknown and highly advanced civilization that existed long ago. After decades of increasingly more detailed photoreconnaissance of the moon, we have yet to discover compelling evidence of alien objects or structures on the surface. Many features that at first attract our attention are at the limits of resolution or are viewed at unfamiliar sun angles or highly oblique look angles. Under different conditions or in higher resolution images, most turn out to be craters, rock outcrops, or other natural features. Carl Sagan was one of the first scientists to suggest the possibility of extraterrestrial activity on the moon. In the 1960s William Blair announced the discovery of “lunar spires” that turned out to be large boulders lit at a low sun angle casting long shadows that looked like towers. George Leonard and Fred Steckling believed they had found extensive evidence of alien activity on the moon, which they described in their books Somebody Else is on the Moon and We Discovered Alien Bases on the Moon. Richard Hoagland argued that there were enormous towers and glass structures visible in Lunar Orbiter and Apollo photography. Attempts to locate these features, in particular, one known as “the shard”, were not successful. In a previous post, we searched for evidence of a “monolith” that the Soviet Union claimed their Lunokhod 2 rover had found, photographed, and analyzed in 1973. Other possible structures purported to have been found on the moon have been investigated and determined to be optical illusions. One was a tower on the edge of the crater Lobachevsky first spotted by Johannes Fiebag. Higher resolution imagery revealed that the impression of a tower was created by a pattern of dark crater ejecta material and a reflection off the rim of the crater. Another was what appeared to be a bridge at the edge of the Sea of Crisis that turned out to be an optical illusion caused by the interplay of shadows. Some of the rectangular features Arkhipov discusses appear to be related to patterns on the lunar surface known as the lunar grid, which was explored by Fielder and others. Lacking evidence of ET activity on the surface leads to the question of whether or not there might be activity underground. 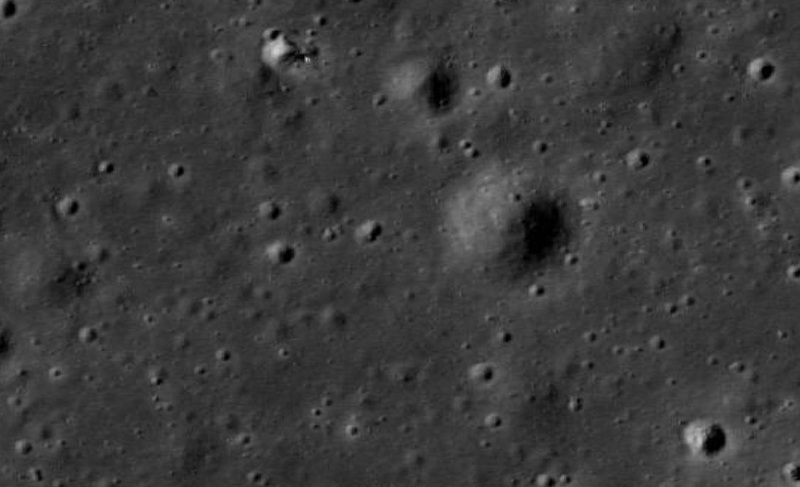 In 2017 Ananda Sirisena, Fran Ridge, and I showed that certain features first imaged by Apollo in the crater Paracelsus C on the far side of the moon are present in more recent Lunar Reconnaissance Orbiter (LRO) imagery and appear even more remarkable up close. 3-D analysis suggests that one of the features may be an opening leading underground. The idea of underground lunar settlements or bases is gaining support after the discovery of lava tubes on the moon by the Japanese Kaguya spacecraft in 2008. It appears that many long sinuous features on the moon called rilles are collapsed lava tubes. The existence of a lava tube is sometimes revealed by the presence of a “skylight,” a place in which the roof of the tube has collapsed, leaving a circular hole. LRO has found hundreds of skylights. 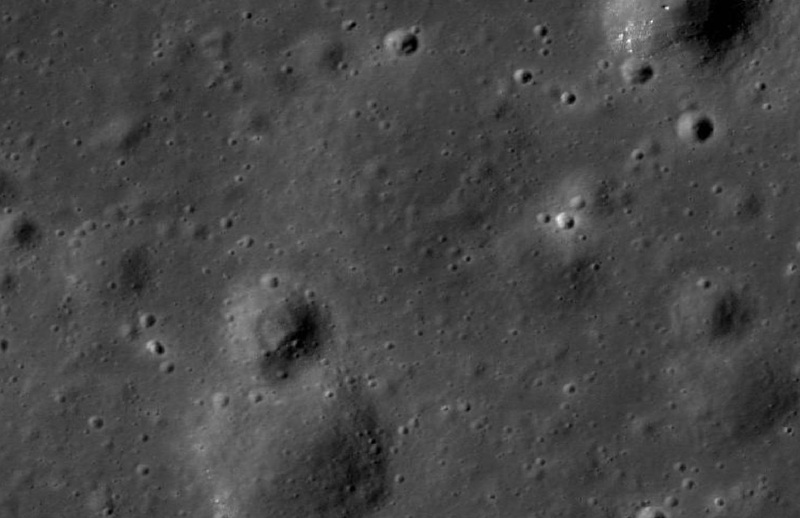 The Chandrayaan-1 orbiter imaged a lunar rille with an uncollapsed segment suggesting the presence of a lava tube near the lunar equator. Gravitometric observations by the GRAIL spacecraft suggest the presence of lunar lava tubes with widths of over 1 km. Large underground spaces the size of cities are possible. Assuming a width-to-height ratio of 3:1, a structure can remain stable with a ceiling that is 2 m thick. Lava tubes at least 500 m underground can theoretically remain stable with widths of up to 5 km. For hundreds of years, astronomers have noticed strange features on the lunar surface. The first recorded sighting was a star-like point of light on the dark side in 1540. Other features that have been reported include small whitish clouds by Cassini in 1671, ‘lightning’ by Louville and Halley in 1715, ‘vapors’ by Schroter and Olber in 1797, brilliant flashing spots on the dark side by Gruithuisen in 1821, dots and streaks of light by Slack and Ingall in 1869, a glow of light in the crater Plato by Fauth in 1907, a moving luminous speck near Gassendi by Haas in 1941, a pulsating spot on dark side by Emanuel and others in 1965, and hundreds more. In 1968, NASA published a compendium of these so-called lunar transient phenomena (LTP) sightings in a report entitled, Chronological Catalog of Reported Lunar Events. A majority of TLP events occur near the maria, which is where many lava tubes are located. Could there be a spatial correlation between TLP events and skylights? Correlation of TLP events (green dots) with locations of skylights. If there were underground bases on the moon that were accessed through skylights one possible alternative SETI strategy might be to image skylights continuously, or at least as frequently as possible, to attempt to detect such activities. One of the instruments aboard LRO is the Diviner Lunar Radiometer that has mapped the global thermal state of the Moon and its diurnal and seasonal variability. If there is an active presence below the surface of the moon it is likely generating heat. Another alternative SETI strategy finds underground activity on the moon using thermal imagery. By correlating optical and thermal imagery it is possible to detect thermal anomalies – areas in an image that are different from the natural background that could be indicative of underground heat sources. NASA’s recent technosignatures report proposes a new approach to SETI based on advanced technologies, future sensor capabilities, and crowdsourcing. Unfortunately, the report reads much the same way as previous SETI strategies that can be characterized as a search for ETs either a long time ago, or in a galaxy far, far away. That reports of TLP and related events have persisted for hundreds of years suggests a more exciting and potentially more relevant strategy to look for signs of an extant intelligence underground. The benefit of this strategy is that even if we don’t find alien bases we might, in the process, find some good places to build our own. Feature image courtesy V101 Science. In this article, we digress from our investigation of ancient mysteries on Earth to examine an unresolved mystery on the moon. Figure 1 Western section of Lunokhod 2 route. From Stooke (2009). Click on image for full resolution view. This is when, according to both the Tass and Soviet Aerospace stories, the rover was analyzing and taking photos of the monolith. The location of the rover over this period of time is marked in the figure with the label “12-2-73 to 16-2-73 X, P” where “X” and “P” indicate that x-ray fluorescence spectrometer measurements and panoramic photographs were taken, presumably after the rover had left the shade of the boulder and traveled south. The Laboratory for Comparative Planetology website lists 92 pan photos captured in 44 sessions. The map in Figure 1 plus three other maps depicting the later movement of the rover show 26 locations where photos were taken. Stooke states that the map does not list all of the panoramas. It is also not clear if the website includes all of the photos that were taken. Most of the panoramas show rolling, relatively featureless terrain. Figure 2 shows one of the photos taken during the second month (lunation) of lunar operations. Notice the angular rock in the center of the photo. The length of its shadow indicates the picture was taken late in the day, not around noon, when the rover was said to have been parked next to the large boulder. Other than Figure 2, none of the photos shows anything resembling a slab, let alone a monolith. Figure 2 Lunokhod 2. Lunation 2. Session 14. Panorama 34. From Laboratory for Comparative Planetology. Click on image to enlarge. If this rock encountered by the Lunokhod rover was so extraordinary why is there no photo of it? Was the announcement by Tass simply propaganda – an attempt to match the accomplishments of the US Apollo program? Or did the Soviets discover something remarkable on the moon, so remarkable that the photos and scientific data were withheld from their own scientists and the international community? After exhausting the available historical data we have reached a dead end. Still, it might be possible to use this information in conjunction with current imagery to search for the monolith using future probes. The Lunar Reconnaissance Orbiter has imaged numerous manned and unmanned spacecraft on the lunar surface including the Luna 21 lander (Figure 3). 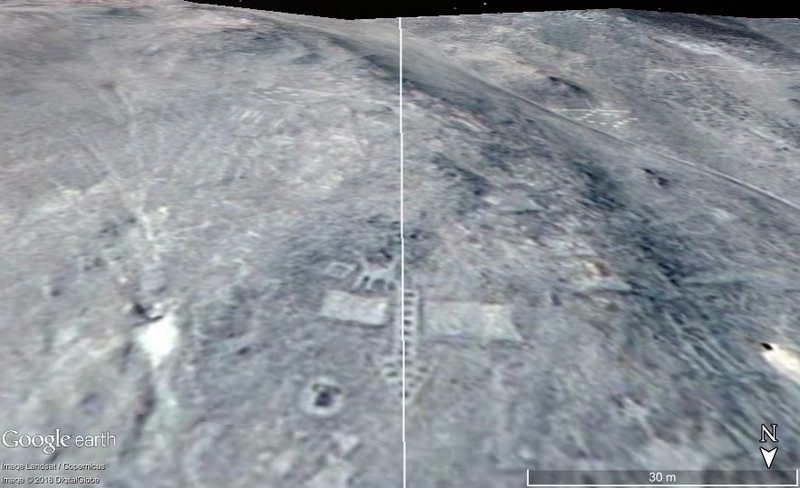 The tracks left by the rover are also visible over much of the terrain, which can be viewed using ASU’s Quickmap viewer. By correlating Figure 1 with LRO imagery we can determine the general area where the rover was parked from February 12-16. An area around 25.87°N 30.45° E is shown in Figure 4. This location, somewhat less than three miles from the landing site, is near several unusual rectangular craters but appears otherwise unremarkable. Although it is not possible to image an object only a meter long from lunar orbit, it may be possible one day to revisit this area on the moon, now that we know where it is, and rediscover what Lunokhod might have found almost a half-century ago. The author would like to thank Rick Sterling, Fran Ridge, and Ananda Sirisena for their contributions. Top image from the move 2001: A Space Odyssey. The term geoglyph has become synonymous with almost any kind of large organized pattern on the ground. Some are the remains of ancient structures long since abandoned, others were created to express an idea, perhaps even to communicate some kind of message. Most defy explanation either in terms of what they represent or attempt to communicate, how they were constructed, or for whom were they intended. A previous post examined a geoglyph known as the Badlands Guardian east of Medicine Hat, in Alberta, Canada. The Badlands Guardian is thought by many to be simply an example of a hollow-face illusion resulting from natural erosional processes. We showed that this feature is oriented to the cardinal directions and by virtue of its orientation with respect to the path of the sun will tend to maintain its facial appearance over the course of the year. 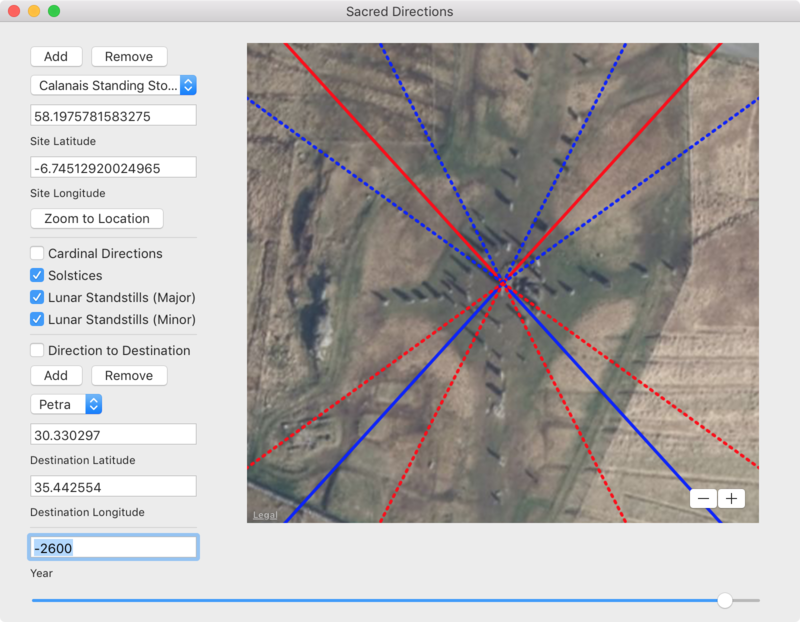 In this article, we discuss the alignment of other geoglyphs aligned to the poles (i.e., north-south) and to other geographic locations. Those of us who live in the northern hemisphere forget that the southern hemisphere currently has no pole star. The Paracas Candelabra is on the north side of a hill on Peru’s Paracas Peninsula. Lacking a celestial reference to north, the Candelabra faces within a couple of degrees of due south (Figure 1). Almost two hundred meters tall, the geoglyph would have provided ancient mariners with a directional reference that can be seen twenty kilometers out at sea. 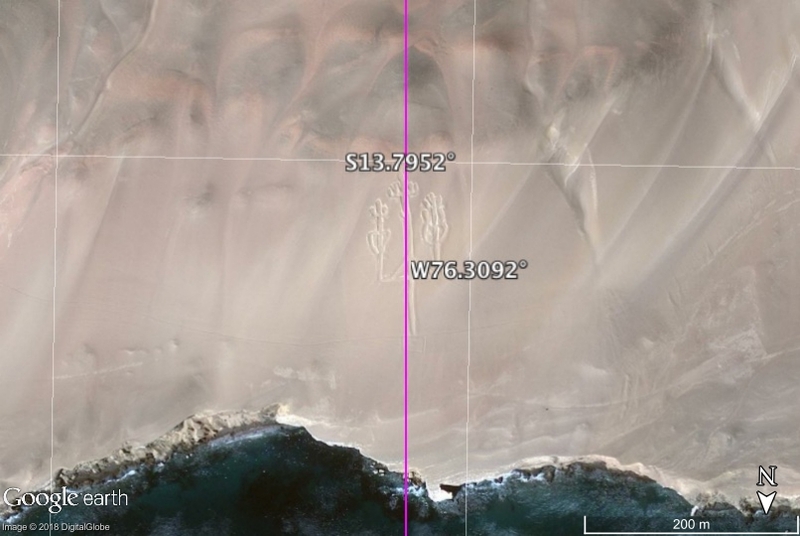 More than a thousand kilometers southeast of Paracas in the northern Atacama Desert near the town of Pintados Chile lie an assortment of geometric, anthropometric, and animal forms on the side of a hill. These figures are smaller, on the order of tens of meters in size. One is an arrow that points due south (Figure 2). Unlike these features rendered on hillsides that can be seen at ground level, the following geoglyphs can only be seen from above. The Blythe Intaglios are a number of large biomorphic glyphs etched into the ground in California along the Colorado River. Three are humanoid forms with outstretched arms. One is aligned to the north (Figure 3). A second figure is aligned with a third that, in turn, points north, northeast. There is also a fourth humanoid figure forty kilometers due east in Bouse AZ that faces south. None of these figures can be fully visualized at ground level. There are no hills high enough or close enough to be able to see these features from above. The inescapable conclusion is that they were built for someone who could view them from the air. Charles Hapgood proposed that the ice ages were caused by shifts in the geographic location of Earth’s poles. He hypothesized that the North Pole was near Hudson Bay during the last ice age. Figure 4 summarizes a series of inter-related alignments. The third humanoid figure mentioned above that points north, northeast is aligned to the Hudson Bay pole, which is approximately 31° east of north. The figure (a) is upside down with its feet facing the former pole. The second humanoid mentioned earlier and an adjacent animal figure are both in line with the third figure (a). The feet of the second figure face the third figure (b). It can be shown that this angle was in the direction of the winter solstice sunrise/summer solstice sunset when the North Pole was in Hudson Bay. This angle is approximately 43° south of east, which is greater than the current solstice angle of 28°. The difference is due to the fact the latitude of the site changed after the Hudson Bay pole shift. The animal figure (c) is rotated counterclockwise relative to (b). The first humanoid figure (e) is aligned to north. The adjacent animal figure is aligned in the current solstice direction (d) as shown in Figure 3. The difference in alignment between the two animal figures (c) and (d) is approximately 15°, which is equal to the difference between the solstice angles. According to Hapgood, during the last ice age when the North Pole was in Hudson Bay, this part of the United States was ice-free with a much more temperate climate than it has today. Thus, unlike other parts of North America, the Southwest has probably been inhabited continuously for tens of thousands of years. 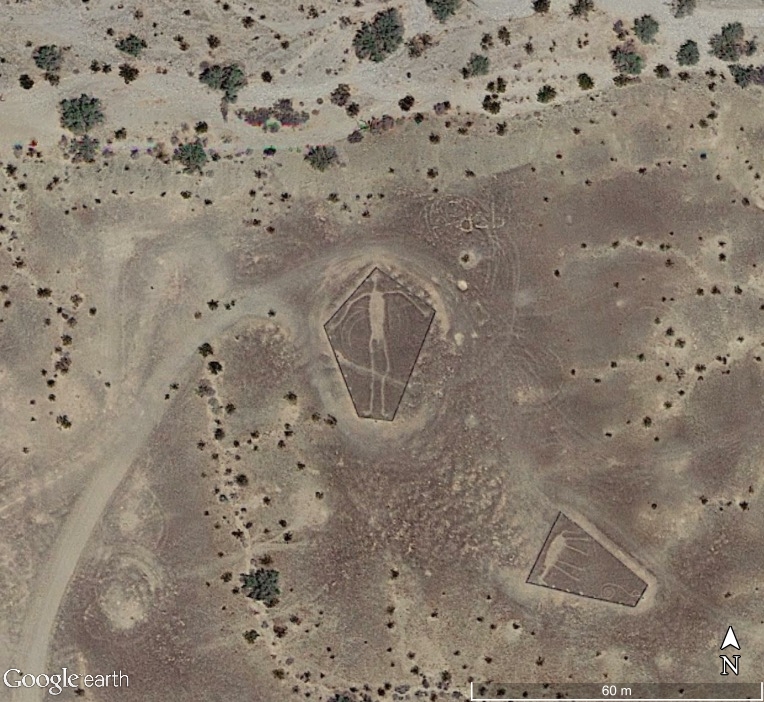 Perhaps the alignment of these geoglyphs along with what they represent might be able to tell us something about the history of this part of the world over this period of time. In Before Atlantis it was shown that the two brightest Nazca lines are aligned to two former hypothesized pole locations in the Bering Sea and the Norway Sea. Numerous sites in Peru including the ancient city of Cuzco were also once aligned with the Bering Sea pole. 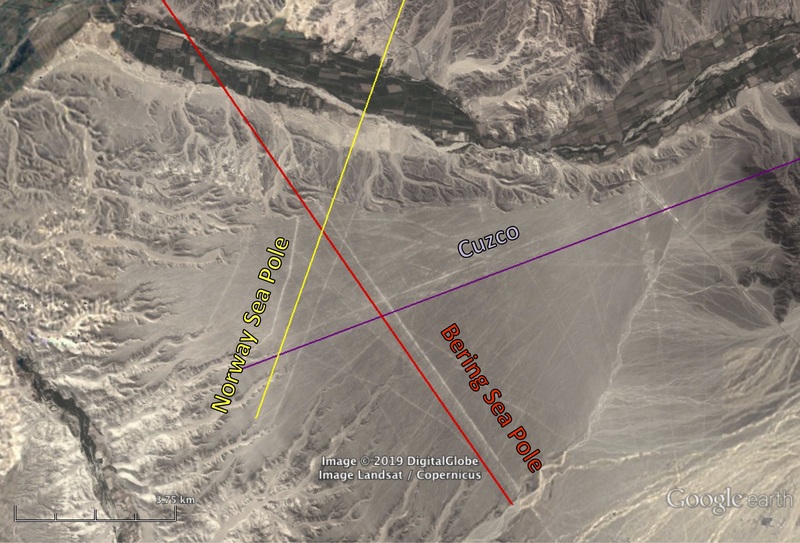 Although many explanations have been proposed for the alignments at Nazca, none have considered their relation to other sites, other geographic locations. Figure 5 shows the correlation of Nazca lines with the direction of the two former poles mentioned above and the city of Cuzco some 370 kilometers east, northeast of Nazca. One can find numerous linear features along the purple line that are oriented toward Cuzco. An examination of the orientation of Nazca’s zoomorphic geoglyphs reveals that seven appear to be oriented with respect to Cuzco as well (Figure 6). The human figure sometimes called the Astronaut (top photo) faces toward Cuzco, as does the Heron. The Condor seems to be flying at a right angle relative to the direction Cuzco. The Dog and Parrot face away from Cuzco. The Spider is also aligned in the same general direction as is the Tree. That at least some part of Nazca at some point in time referenced the ancient city of Cuzco is apparent. 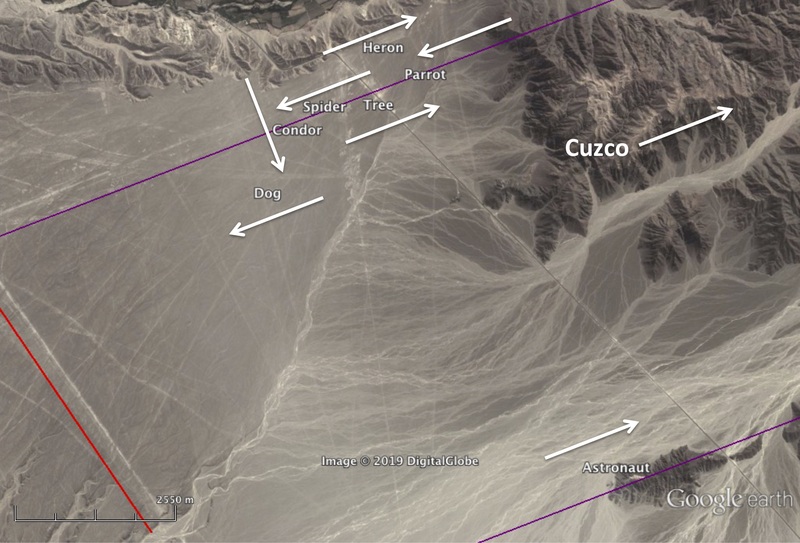 Although it is beyond the scope of this article to speculate about its purpose, one wonders whether the Nazca lines could have once been a kind of map to help guide someone or something approaching Cuzco in the air from the west? 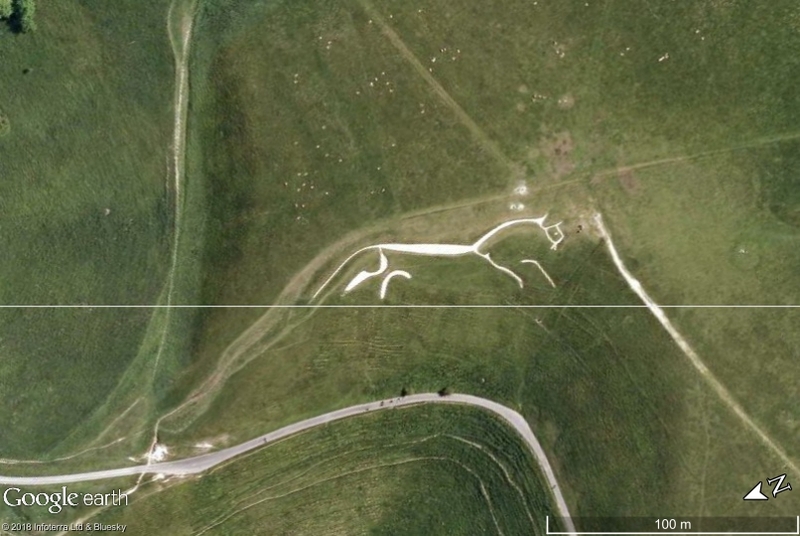 The Uffington White Horse is located on a hillside in Oxfordshire, England. The figure, deeply cut into the soil and filled with chalk, is oriented south, southwest. One theory for why the horse is aligned in this direction is that in midwinter the sun appears to overtake the horse, reflecting a mythological belief that the sun was carried across the sky on a horse or in a chariot. We propose another explanation. If we draw a line between here and Stonehenge, the horse appears to be headed precisely in that direction (Figure 7). Dated to 1380 to 550 BCE, a relatively short time after the completion of the last phase of construction at Stonehenge around 1600 BCE, could the Uffington White Horse have been a directional marker pointing toward Stonehenge? Top image courtesy Marilyn Bridges. 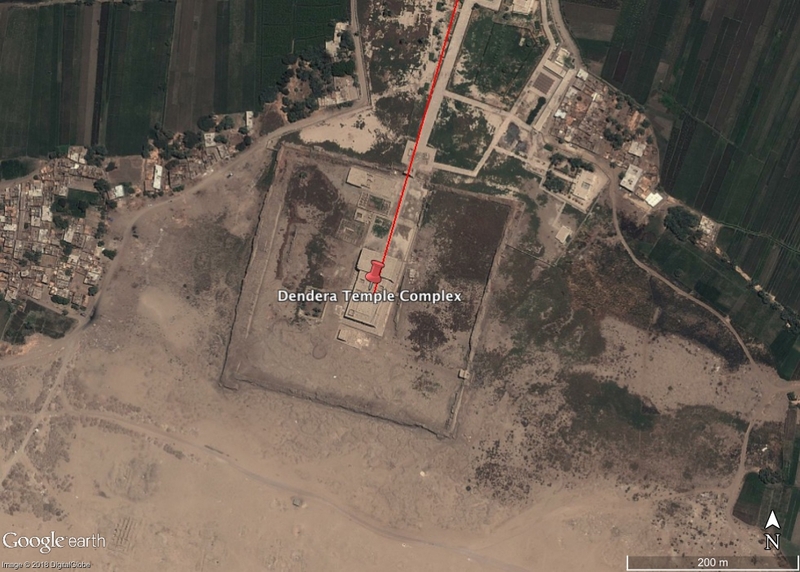 This article presents new astronomical evidence supporting the existence of an earlier temple at the site of the current temple of Hathor at Dendera in Egypt. The temple of Hathor is west of the Nile River thirty miles north of Luxor. The construction of the present temple began in the first century BCE during the last Egyptian dynasty and was completed in the first century CE under Roman rule. The Egyptian goddess Hathor had many aspects: mother or consort of the sky god Horus, a symbol of femininity, a guide to the afterlife, and others. Hathor was often depicted as a cow, or a woman wearing a headdress of cow horns. The temple and several nearby structures are oriented approximately 17° east of north. Too far north to be aligned to the Sun, Moon, or planets, it is believed the temple was aligned to the rising of a star or constellation associated with Hathor. It is convenient to think of the stars existing on the inside of a celestial sphere. As Earth revolves on its axis, the stars appear to rotate around the celestial poles. At Dendera, the north celestial pole is 26° above the northern horizon. The point on the horizon 17° east of north along the major axis of the temple traces a circle 31.4° away from the north celestial pole. As shown in Figure 1 this path is currently about 10° away from Alkaid. Alkaid thus does not currently rise in line with the temple. Figure 1 Current alignment of the Temple of Hathor to the celestial sphere. Sky Publishing Corporation. As the tilt of the Earth precesses over a 26,000-year orbit about the ecliptic pole, the north celestial pole follows the path of the dotted line in Figure 2. Figure 2 Precession of the north celestial pole over the 26,000-year cycle. Sky Publishing Corporation. There are two points along this path, two times during the precessional cycle when Alkaid rises directly in line with the Temple of Hathor (Figure 3). The most recent was when the current temple was built approximately 2000 years ago. 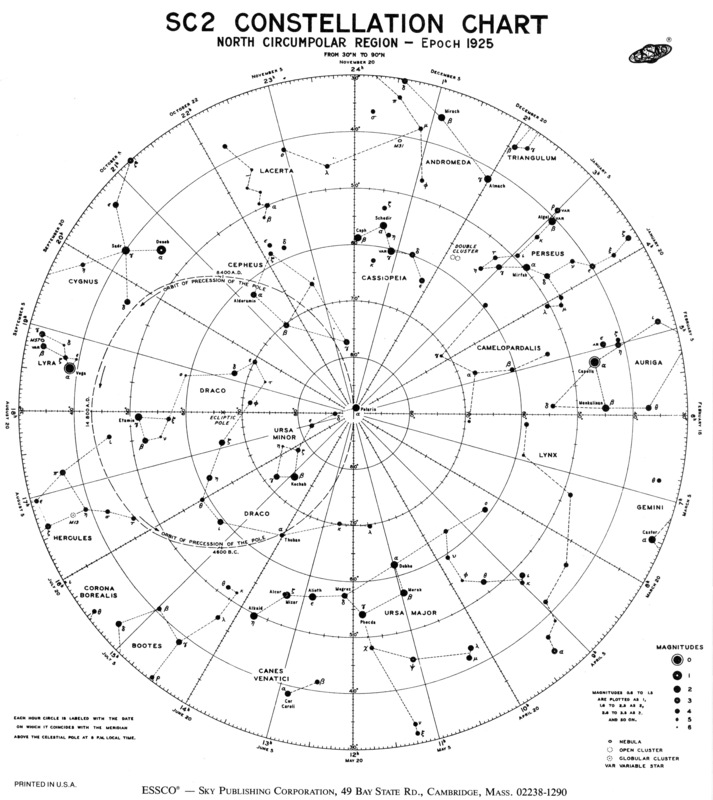 At this point in time, the north celestial pole was between Polaris and Thuban and so there was no pole star. The second time was about 10,000 years ago when the pole star was in the constellation Hercules. Figure 3 Alkaid aligns twice to Temple of Hathor at Dendera during the 26,000-year precessional period. Sky Publishing Corporation. Interpretations of hieroglyphics in the temple and the zodiac of Dendera attach special importance to the astrological sign of Cancer. In contrast to Greek and Babylonian zodiacs, Cancer is placed at the center of the Dendera zodiac. One theory is that the Egyptian civilization began during the age of Cancer. 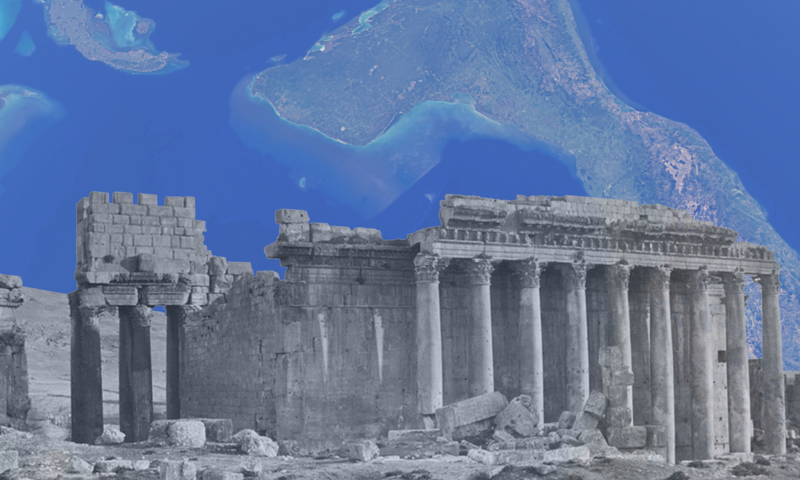 At this time about 10,000 years ago the pole star was in Hercules and Alkaid rose in line with the major axis of the temple just as it did 2000 years ago when the current temple was built (Figure 4). How is it that the Temple of Hathor aligns with its celestial counterpart Alkaid on these two particular dates? Let us evaluate the alignment of the Temple of Hathor in a broader prehistorical timeline. 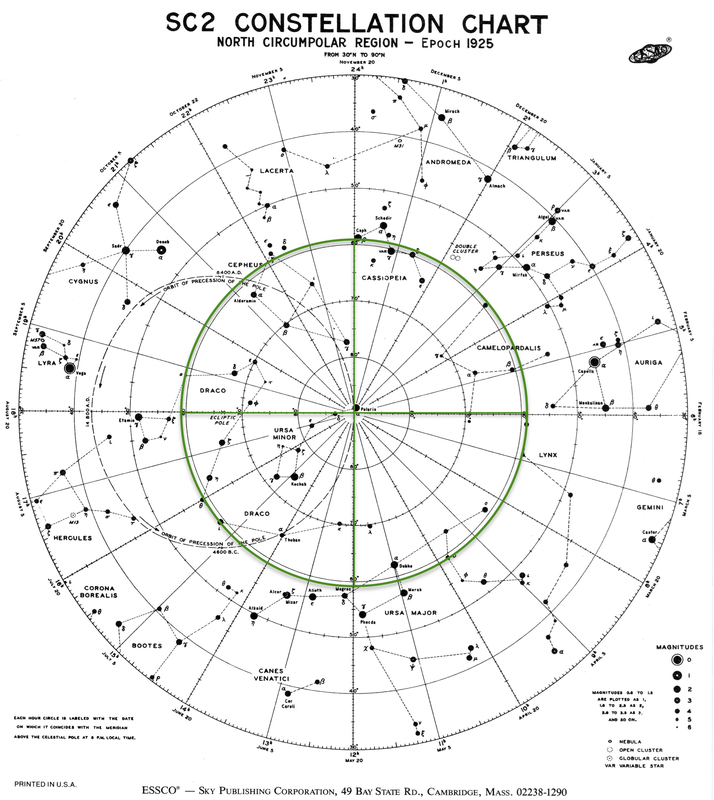 As described in Before Atlantis, inspired by Charles Hapgood’s crustal shift hypothesis, we have computed four past locations of the North Pole based on the alignment of over fifty sites throughout the world. The oldest pole location is in the Bering Sea north of the Aleutian Islands. It turns out that the major axis of the Temple of Hathor points directly toward the Bering Sea pole. By virtue of its association with this ancient pole, this site could be much older than is currently thought. We propose a new chronology where the site was originally aligned to the north when the pole was in the Bering Sea approximately 125,000 years ago. After the Bering Sea to Norway Sea and subsequent pole shifts, the site became misaligned to the north. At the start of their civilization, the ancient Egyptians, the followers of Horus, co-opted what was already an ancient site. Aligned then with Ursa Major and Alkaid, a temple to the star’s terrestrial counterpart, the goddess Hathor, was built. (In Before Atlantis we propose a similar explanation for the alignment of the Parthenon and its relation to the Greek goddess Athena.) With knowledge of precessional motion, thousands of years later, the Egyptians rebuilt the temple when it again became aligned to Alkaid. 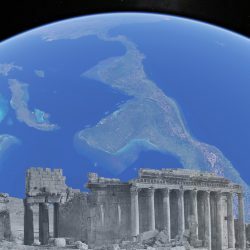 If this explanation is correct then the original site could have been established more than 100,000 years by the mythical netterw who, like Augustus LePlongeon’s naacal, were not gods but an advanced technological civilization that had developed from earlier human sub-species out of Africa 200,000 to 300,00 years ago. Feature photo courtesy Marilyn Bridges. Inspired by videos created by Megalithomania and Brien Foerster, who first found the site, this article examines the Inca Steps of Quenuani between the towns of Cuturapi and Yunguyo on the Peruvian shore of Lake Titicaca. From clues in these two videos, the geographic location of Quenuani has been determined using Google Earth to be at latitude 16.259446° S and longitude 69.171322° W. Based on rough measurements from the image (Figure 1) the linear rock cuts appear to be aligned approximately 23° west of north. This implies the steps face 67° east of north. Is there a celestial explanation for this alignment? 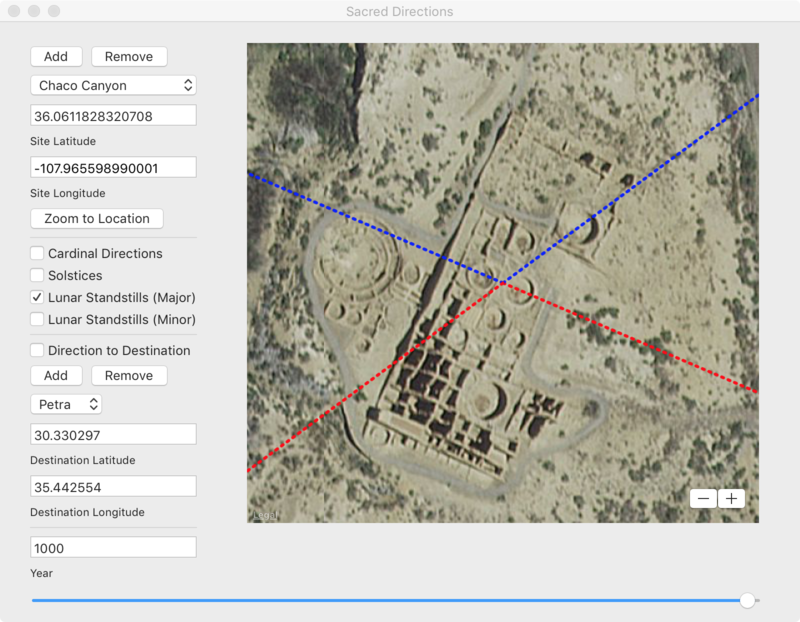 Using a location analysis tool developed to support the research presented in Before Atlantis, the angle 67° can be shown to be just outside the range of solstice sunrise alignment angles (64.8° to 66.6°) over the past 41,000 years. Measurement error is one possible explanation for the discrepancy. Figure 2. Puma Punku is slightly misaligned to the east. The site of Puma Punku is located 38 miles southeast of Quenuani. Puma Punka and nearby Tiwanaku are not aligned exactly to the cardinal directions but are rotated slightly east of north. In Before Atlantis we have determined four prior locations of the North Pole over the past 125,000 years based on Hapgood’s pole shift hypothesis. Between 75,000 to 125,000 years ago, the North Pole is thought to have been in northern Greenland. In this part of Peru, an ancient Greenland pole would have been in the direction 1-2° east of north. If the North Pole were in Greenland, Puma Punku would face due north. Quenuani would also be rotated slightly to be within the range of solstice sunrise angles (65.9° to 67.7°). Based on its orientation it is likely that Quenuani was built as a place to observe the sunrise over Lake Titicaca on the solstice. It is also possible, if Hapgood’s theory of pole shifts is correct, that Quenuani, and perhaps other sites in the area such Puma Punku and Tiwanaku may be related by virtue of their alignment to an ancient pole in Greenland and could be 75,000 to 125,000 years old. This series of articles discusses three surface features that resemble faces: a strange landform in Alberta Canada known as the Badlands Guardian that was discovered in 2005, a carved stone formation found by Daniel Ruzo on the Marcahuasi Plateau in Peru in the 1950s, and the Face on Mars, a mile-long structure on the surface of Mars first imaged by a Viking orbiter spacecraft in 1976. The Face on Mars has become a classic example of pareidolia – of seeing faces where there are none. Yet, despite NASA’s claims to the contrary, as we shall briefly summarize in this article, there is significant evidence to support the hypothesis that the Face and other nearby objects are artificial in origin and probably incredibly ancient based on their highly eroded state. Figure 1 360° rotation of face computed from Mars Odyssey/THEMIS imagery. When it was first imaged by a Viking orbiter more than four decades ago, NASA dismissed the Face on Mars as a trick of light and shadow. I tested this assertion using an algorithm we had developed at TASC – a tech firm north of Boston – known as “shape from shading” that computes a 3D model of the Face from the available imagery. Since only two images existed at the time, both taken under similar conditions, I used the 3D model to render synthetic images at different simulated sun angles and viewpoints. The results, which were published in the journal Applied Optics, showed that the Face maintained its facial appearance over a wide range of imaging conditions and so is not an optical illusion as claimed by NASA. The Face on Mars is more than a mile wide and 1-2/3 miles long. Could the Face have been constructed by modifying a pre-existing landform? A colleague of mine at TASC had developed an algorithm to detect manmade objects in images using fractals. A fractal is a mathematical concept to describe objects in nature that are self-similar including the shape of coastlines, the structure of natural terrain, and many other kinds of phenomena. Fractal models are often used in computer graphics to generate photo-realistic renderings of natural features. Instead of using fractals to generate images his idea was to use fractals to analyze images, specifically to detect manmade objects by finding areas in images that deviate from a fractal model. When we applied his fractal algorithm to the Viking imagery the Face was found to be different from the surrounding landforms. Is it unreasonable to conclude that this landform was different from the other landforms because it had been modified to look like a face? Figure 2 Comparison between an orthorectified MGS image and its mirror image. Multiple points of symmetry are evident. Mars Global Surveyor and later orbiters showed that the Face is much more eroded than was previously thought. In particular, the right (eastern) side appears to have slumped (perhaps due to a process that is known as mass wasting) and is covered with dunes. As shown in Figure 2 there clear evidence of symmetry in the platform surrounding the Face, the forehead, and the eyes. There are also repeated expressions of symmetry and the geometry of 3-4-5 right triangles in its shape and internal features. We close with a rendering of the Face as seen from the southwest. It is a time-lapse view over the course of a summer day on Mars. Like those enigmatic features on the Marcahuasi plateau discussed in the previous post, if the Face on Mars is an optical illusion, nature is having a great joke on us.